Colorado’s pot experiment: The unintended consequences of marijuana legalization. It hasn’t caused the havoc opponents predicted, but Colorado’s bold marijuana experiment is having some unexpected consequences. 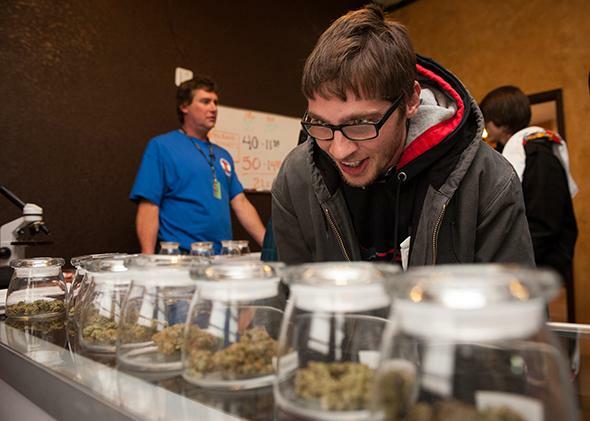 A man selects marijuana strains to purchase at the 3-D Denver Discrete Dispensary on Jan. 1, 2014, in Denver. Nearly five months into Colorado’s great pot experiment, the early returns are good. In Denver, home to the bulk of the first-in-the-nation retail stores, violent crime fell by 5.6 percent over the first four months of the year, with major property crimes down nearly twice that, according to the city’s police. State coffers, meanwhile, are flush with tax revenues from the nearly $50 million worth of recreational weed that was sold through March, the last month for which official estimates are available. Those sales translate into $7.3 million for the state, a number that jumps to $12.6 million when you factor in medical marijuana and licensing fees. Lawmakers are already trying to figure out how to spend future revenues that are projected to reach $98 million this year alone. It’s too soon, however, to call Colorado’s measure an unqualified success. Officials had long warned of unforeseen problems once the retail stores opened their doors on Jan. 1, and such fears have proved legitimate thanks largely to how people are choosing to get high. So-called edibles are being blamed for an increase in the number of pot-related emergency room visits, including those from a half-dozen or so children who unknowingly ate pot-laced treats. The baked goods and candies also are believed to have played a role in two deaths in the past two months—providing opponents with front-page anecdotes that run counter to the cannabis-kills-no-one narrative long trumpeted by legalization advocates. A college student visiting from Wyoming jumped to his death from a Denver hotel balcony in March after consuming six times the recommended dose of a pot-infused cookie. The following month, a Denver man is believed to have shot and killed his wife after eating pot-laced candy, although police concede that he may have had other drugs in his system, too. Edibles aren’t the only problem. Colorado authorities are also dealing with a rash of fiery house explosions caused by pot enthusiasts making THC-rich hash oil in their homes through a dangerous process that involves heavy amounts of butane, a highly flammable gas that can linger and ignite. Earlier this week in a suburb of Colorado Springs, firefighters responded to one such explosion at an apartment and found two adults and a 3-year-old child trapped inside. No one was injured, although the adults now face reckless endangerment charges in addition to child abuse and arson. It was a similar scene late last month in Jefferson County, where hash oil–making is believed to have caused a blast that destroyed a townhouse. All told, firefighters have responded to more than 30 such explosions this year already, roughly three times the number from all of last year, according to the Rocky Mountain High Intensity Drug Trafficking Area agency. Regulators are already pursuing some obvious solutions. Lawmakers are considering legislation that would require edibles to be individually wrapped and labeled, both to give consumers a better idea of what they’re getting themselves into and in hopes of keeping the treats out of the mouths of children. (Officials have already limited the amount of THC in edibles to 10 milligrams per serving, with the number of servings in a package likewise capped at 10—nice round numbers that, as Rolling Stone’s Bruce Barcott has pointed out, suggest officials are guessing as to how much is too much at this point.) Stopping the meth lab–like house explosions may be harder, but one option that has been floated is a crackdown on the bulk sale of butane, much like the strict limits on over-the-counter cold medicines that are often the building blocks of meth production. Longer-term challenges will require more complicated fixes. Recreational weed comes with a hefty surcharge, including a 15 percent excise tax and a special 10 percent sales tax on top of the regular 2.9 percent one. As long as legal weed is more expensive than its tax-free illegal stuff, there will always be a black market. The trick for regulators is finding a tax-adjusted price that allows the state to bring in revenues while still keeping weed cheap enough where most people will be willing to pay the markup to keep things above board. So far, they appear to have found a sweet-enough spot, although that could change as the novelty of legal marijuana wears off and consumers’ tastes change. Regulators must also find a solution to federal banking requirements that has pot shops operating like cash-only lemonade stands, and a way to make sure that small home-growing operations—legal under the law—don’t flourish to the point where they fuel their own unregulated market.